EagleVail’s Mikaela Shiffrin continues to rewrite the World Cup ski-racing record book at the remarkably young age of 22. On Monday, New Year’s Day, Shiffrin won her 37th career World Cup race — a dual slalom city event in Oslo, Norway — tying her for sixth on the all-time wins list with the most dominant women’s slalom skier in ski-racing history, Shiffrin’s childhood idol, Marlies Schild of Austria. Schild, a retired Austrian star, won the most slaloms ever on the women’s circuit with 35, but Shiffrin is now just eight behind her with 27. Monday’s win was the sixth so far this season for Shiffrin, the defending overall champion who won 11 races last season. She has a realistic shot at surpassing Lindsey Vonn’s American record of 12 wins in a season and maybe even has her sights on Vreni Schneider’s all-time record of 14 wins in one season. If Shiffrin continues her winning ways this week in Croatia, she will no doubt add to her sizable lead in the overall chase and could move past Schild into sole possession of sixth place on the all-time victory list. It’s also not unrealistic to expect Shiffrin could also catch and pass fifth-place retired great Anja Paerson’s 42 wins later this season. Vonn, who lives in Vail, is the greatest women’s racer of all time with 78 victories. OSLO, Norway (Jan. 1, 2018) – Mikaela Shiffrin (Eagle-Vail, Colo.) rang in a foggy start to the New Year with her 37th career FIS Ski World Cup victory in the city event dual slalom in Oslo, Norway Monday night. It was her second-career city event victory and her seventh World Cup win so far this season. Competing on a tight dual slalom course covered in a blanket of fog, Shiffrin and Switzerland’s Wendy Holdener both entered the finals undefeated as Shiffrin took the first run by a slim 0.01-seconds. Shiffrin then took the second run by 0.17 seconds to remain undefeated for the evening while picking up another 100 World Cup points. Nineteen-year-old Melanie Meillard defeated Sweden’s Frida Hansdotter in the small final for her first career World Cup podium in third. With the victory, Shiffrin tied her childhood idol Marlies Schild, and is now sixth on the all-time World Cup win list at age 22. In the men’s event, Sweden’s Andre Myhrer defeated Austria’s Michael Matt for his first city event win. Germany’s Linus Strasser defeated Great Britain’s Dave Ryding for third. With the victory, Shiffrin extended her overall World Cup lead to 471 points over Germany’s Viktoria Rebensburg, who did not compete Monday. 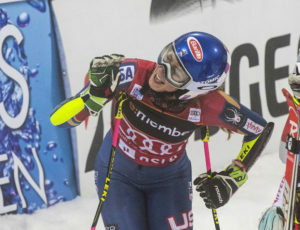 She also further extended her overall World Cup slalom lead over Slovakia’s Petra Vlhova, who finished tied for fifth. Up next, the women compete in an evening slalom Jan. 3 in Zagreb, Croatia. The men compete in an evening slalom Jan. 4, also in Zagreb. For the U.S. women, Shiffrin, Megan McJames (Park City, Utah), Resi Stiegler (Jackson Hole, Wyo.) and Nina O’Brien (Edwards, Colo.) are scheduled to compete Wednesday. On the men’s side, David Chodounsky (Crested Butte, Colo.), Michael Ankeny (Deephaven, Minn.), Mark Engel (Truckee, Calif.); AJ Ginnis (Vouliagmeni, Greece), Robby Kelley (Starksboro, Vt.) and Hig Roberts (Steamboat Springs, Colo.) are scheduled to compete in Thursday’s slalom.